Kaitlin began dancing at the age of three, she took Ballet, Tap, Jazz, and Acrobatics. She continued taking classes through her late teens. During college she searched for classes to take and discovered Barre! Her love for Barre led her to obtain her barre certification through Total Barre. Students can expect a challenging workout choreographed to an upbeat music and of course to have a lot of fun! Lindsay Hansen is a full time dance educator for Hartford Public Schools. She holds a certification in Dance Education and Elementary Education. Lindsay is comprehensively certified Peak Pilates instructor. 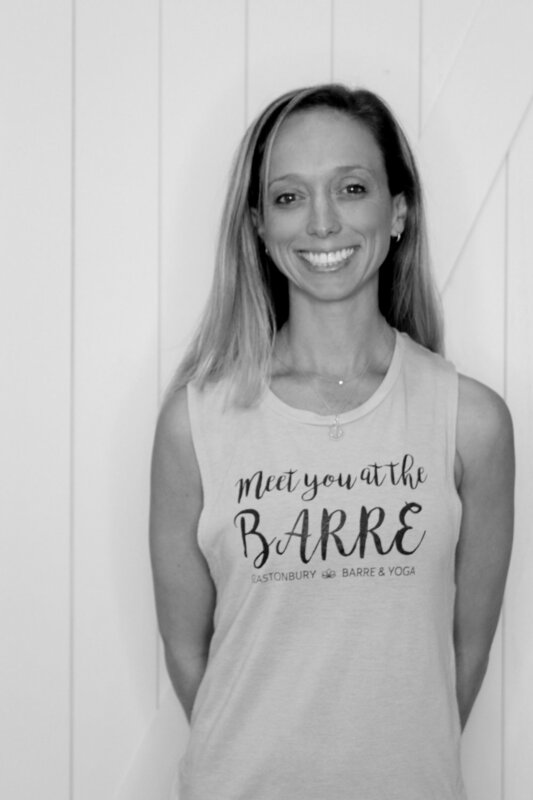 Lindsay has been a Barre, Pilates, and movement instructor for over five years. Alyson is passionate about leading a healthy and fulfilling life, while helping others to achieve the same. Yoga has always felt like her true calling and Alyson is grateful to share this vocation with others. She is a RYT and completed her 200-hour Hatha Yoga Teacher Training at the InHarmony AyurYoga school in Estepona, Spain. She specializes in Ayurveda, a sister-science to Yoga, which translates to the Science of Life. Therefore, her practice might be slow and grounding on a hot summer day, or uplifting and invigorating on a damp; cool spring morning. She enjoys teaching yoga to all people, at all levels and abilities, while respecting each body’s unique need. Alyson recently completed her Level I certification as an Energy Medicine Yoga practitioner, and continues to study with Lauren Walker. Alyson believes that combining mind, body, and energy work through Yoga is what really creates a unique and beautiful practice for each individual. While Alyson is not teaching, she enjoys spending time outdoors, hiking, reading, writing, and is working towards completing a Masters in Integrative Health and Healing. Meredith received her RYT-200 yoga teacher certification at Kripalu Center for Yoga & Health. Initially, Meredith's yoga practice began as a way to exercise and sweat but it quickly became a daily ritual. Yoga has transformed the way Meredith sees life and the strong connection between the mind and the body. Meredith is also a certified Total Barre instructor, where she is able to use her dance and choreography experience. In her classes, you will feel her love for dance, music and movement. Meredith plans to continue to grow and focus her career in the health & wellness industry. Ashley is a certified barre and Pilates instructor. Ashley began her journey as a student taking classes for strengthening and conditioning after an injury to her iliopsoas muscle, which left her with limited flexibility and range of motion. As she continued to add barre fitness as part of her daily regimen, she discovered how much it helped in her healing and recovery process. Ashley became empowered and compelled to want to share her success with others. She will be joining our team Saturday mornings at our front desk, welcoming and greeting clients, and substitute as a barre instructor. Ashley holds a Bachelor of Science in Legal Studies and a Master of Arts in Criminal Justice. Ashley's goal is to continue to share her journey with clients, as she continues her path in law school. Liz began studying classical ballet at the age of three, continuing through her teens. Her dance background has helped her to understand the body from a movement perspective and also to see and understand the connection with body and mind. At the same time she was yearning to get back to her dance roots, barre classes were becoming popular. It was a natural next-step for Liz to begin teaching barre. She is certified through Exhale in New York City. Students can expect a challenging workout, ever-changing routines, killer playlists, positive feedback, but most of all, to have fun! Liz loves to switch it up – moving from the bar, down to the floor using lots of props to really challenge the muscles, sweat and sculpt. Liz is also a RYT200 certified yoga teacher from West Hartford Yoga. Forever a student, Liz travels widely for unique learning experiences to further her teaching. In addition to dance and yoga, Liz loves music, travel, fashion and great food. She continues to create a life filled with things she loves, people who inspire and challenge her to grow, and new adventures every day. Carrie is a Movement Therapist with a dual Master's in Movement Therapy and Counseling. She has dabbled in many Movement forms including Ballet, Hip Hop, Modern, Bellydancing and Krav-Maga. Lately she focuses much of her time honing her AcroYoga skills; and has been teaching Barre since summer of 2016. Carrie has been Irish Step dancing since she was seven- ask her to teach you a jig! Moey has been practicing varying styles of yoga for 10 years. A lifelong athlete, she discovered Bikram yoga in her early 20s, and later became addicted to crossfit, kickboxing, and power lifting. After a severe injury forced her to reconsider her physical fitness involvement she found vinyasa as an alternative to her previous strenuous exercise. What she didn't expect to find when she began vinyasa was the power of pranayama and meditation as healing practices. Primarily a student of Beryl Bender Birch and The Hard and the Soft Yoga Institute, her teaching is influenced by the Ashtanga tradition. She is a Registered Nurse full time, and with her knowledge of anatomy her classes are focused on alignment and breath work. Her vision is to spread what she has found in yoga to anyone and everyone open to the practice. Rich has been an Army officer, a schoolteacher and tutor, and a youth sports coach. He considers it his calling to lead and inspire others. He suffered a series of knee injuries thanks to sports and found yoga in 2010 because of the injuries. He initially used yoga to help rehabilitate his knee. Over 8 years of practice, he strengthened his body, mind, and spirit and wants to help others do the same. He completed his 200hr YTT training at the Yoga Shop in December 2017. Taryn “TK” Keenan native of Wethersfield CT, has been dancing since the age of 3. She studied with many studios in CT including, Alyce Carella Dance Centre, Limelite Dance, Miss Frances School of Dance and Dance 10. TK Graduated from the Greater Hartford Academy of the Arts then went on to study Dance at Louisburg College in North Carolina. She presently teaches at New England Dance in Cromwell and for the West Hartford Community Center. TK has been teaching Barre for two years and is addicted! She loves the ballet based moves paired with isometric exercises to the beat of today’s hottest music! Megan is a 300 hour certified yoga instructor through Aura Wellness Center. With over a decade of her own personal practice, she has developed a passion for finding "peace in strength." As a yoga instructor she has taken this passion and made it compatible for all-levels. Through Power, Vinyasa, Gentle, Prenatal, and Postnatal Yoga Megan is committed to reaching as many people as possible. Whether this is your first time at a yoga studio or you have been practicing for years, she welcomes you with open arms. Stacey is a RYT200, completing her training at Sacred Rivers Yoga. Her journey began in childhood when she picked up a book on yoga and began practicing the postures for fun. In college she finally attended her first yoga class, still viewing it as a purely physical practice. It wasn’t until many years later when faced with serious health challenges that she began to embrace the mind/body aspect of yoga. She adopted a fully holistic approach to health, and has discovered the many healing benefits the practice offers, from stress reduction to pain management. As a busy mom of 3 boys, Stacey spent many years giving all of herself to her family. Yoga has taught her that we need to fill our own cups so that we have the energy to give to others. The practice has transformed all areas of her life, bringing abundant peace, joy and balance. Stacey feels blessed to be able to share the sacred practice of yoga and is passionate about empowering everyone through love and positivity. She creates a safe space where students are encouraged to go within and listen to their intuition to lead them through their practice. She wants her students to fully embrace and love themselves for where they’re at and have confidence to explore their potential. Her goal in her classes is to invoke a sense of peace and security, motivating students to find the courage to let their inner light shine.